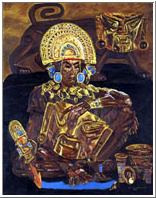 Viracocha Inca: "God, Maker of the World"
Viracocha was a man very tall in stature 7 foot 3 inches. He had bright red hair with a priest tonsure in the middle of his head. He had pale white skin, dark blue/green eyes with a red goatee beard coming down past his chin. He wore a very long white vestment flowing all the way to his sandals. He wore a girdle of leopards or puma's around his waist. He had a very long nose with well-rounded eyes. In his hand he carried a Breviary that reminds us of what priests carry. In his other hand was a long staff. His white gown or vestment had a stream of red crosses over it. With him he brought builders, painters, astronomers, agriculturists, draughtsmen, potters, weavers and engineers. When the Peruvian Indians saw how tall and wondrous he was they were in awe of him. He told the Indians he was a priest ruler from a far off land. He showed them authority and veneration. He showed them great power. He taught them to grow food in any season. To turn hills into plains and plains into hills. 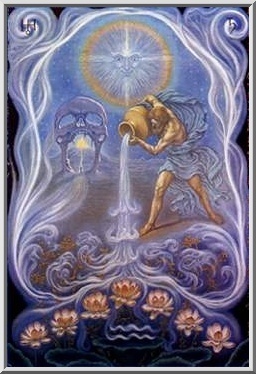 They watched him as he produced water fresh from rocks and dug up water from the land. They were astonished at all his knowledge. He taught the Indians how to map the sun emerging from the waters of Titicaca. Viracocha then with his people and the natives to the lakeside Metropolis of Tiwanaku, explaining all the different races the world has. Viracocha told the Indians of two characteristics of Man. Positive Man doesn't mind going hungry if the majority of the people eat. Neutral Man keeps all the water, all the food, and all the of the money. Positive Man carries water to all people, gives food freely, and doesn't need money. Neutral Man believes nature is dead, trees, rocks, the Earth, the water, so he's not hurting anything, since its dead, poisoning and burning is not harming. Positive Man believes nature is all alive and we are only tenants on the earth, we should look after the trees, rocks, the water and the earth. Neutral Man is hierachitical, status driven, greedy and refuses all opposition. Positive Man believes everybody is on the same level, everyone should share that all beliefs are valid. Neutral Man believes animals should should be kept in nets or bars to be seen by the rich and the high status. Positive Man believes animals should exist in their own world well away from people, the animals were here before mankind. Neutral Man believes in control, to monitor all actions, doesn't believe in freedom. Positive Man believes in freedom, freedom of expression, freedom of movement, freedom of speech. Neutral Man believes in distruction, believes in war, fears all around him. Positive Man only uses weapons for food and the building of homes, loves peace and wants to live in harmony with people and nature. Neutral Man is paranoid, greedy, mad, freakish, afraid and a killer. Positive Man is only happy when celebrating with the people in music or art form. Positive Man at his source is hotness and a warm soul. Viracocha spoke lovely and warmly to the natives, they came from miles around to see the Priest, Giant and Teacher with a sweet voice. Viracocha told the Indians that God demanded no wars and forbade fighting, violence and robbery. "Oh Viracocha, ancients Viracocha, Skilled Creator, Who makes and establishes, On the Earth Below." "May they Eat" "May they Drink"
"You say, For Those you have established. Those you have Made... May Food be Plentiful. Potatoes, Maize, all kinds of food, May There Be......."
In many places they tell of how he gave rules to man, how they should live and that he spoke lovingly to them with much kindness. Telling and preaching that they should be good to each other and not do any harm or injury but that instead they should love each other and show charity. Indians were shown how to build a harp. 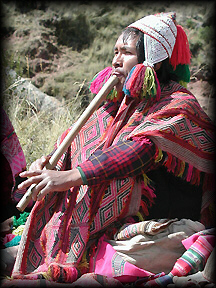 Viaacocha showed them a special flute, with a seven-note scale. In Europe, we have four note scales. He traveled with his entourage teaching new skills. In the province of Collal they call him "Tuapaca" and around other places he was called "Arunaua." In many ports, temples are built to him, in which they placed stone statues in his likeness, in front of which they made sacfifices. The large stone statues are at the site of Tiahuanaco. 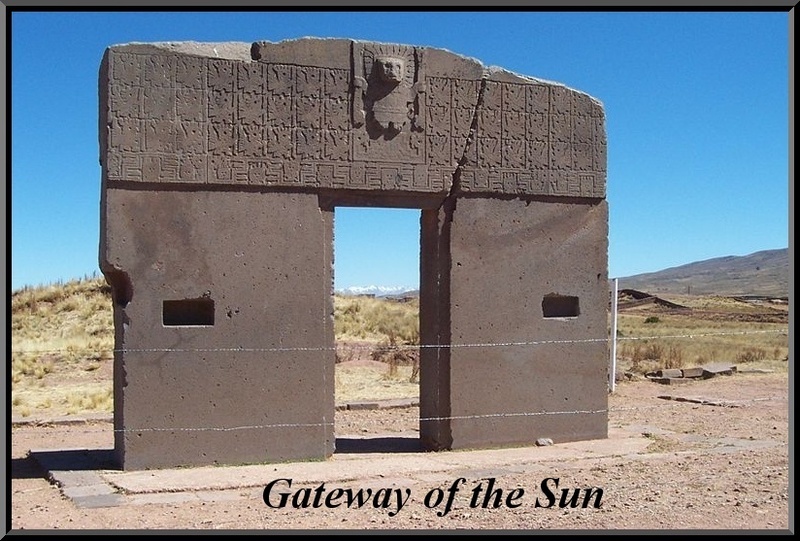 At the site of Tiahuanaco there is the Gateway of the Sun. On the front above the doorway is a carved facade which centres around the figure of the supreme God of the universe, "VIRACOCHA" In his hands, each of which has only four fingers, he holds a spear thrower and a quiver containing two spears. His tunic is bound by a girdle covered with puma heads, either side of him are 24 atten-dance's portrayed running towards him and beneath his throne are 16 carved figures. No other sculpture has been found in Peru. A very tall man, Viracocha has been called "The Weeping God of Tiahunaco." He showed the natives how to record information with string and knots. Viracocha and his followers taught them sexagesimal the system of mathematics, which shows alignments, astronomy with the base number 60. His followers showed the natives ceramics, which could record maths, music and pictographs. Language could be handed down from father to son, mother to daughter. Viracocha and his people then went to Nazca, followed by the natives he told that the next time he would return from the sky. The Indians will mark his way with maps of the heavens. It was Viracocha that designed the famous Nazca Lines to be seen only from the air. He told them stories of a land that drowned under the water with concentric circles surrounding it. He told them songs which gave them a way of recalling maths and geometry. Viracocha and his followers taught the Indians to specify in all knowledge. His followers showed them how to build canals, how to channel water, new concept of artificial watering and irrigation techniques. With Viracocha came Astronomers, Architects, Surveyors, hyd-rologist, botanists and Agriculture specialsits. They taught the Indians how to create ridge fields, long planting ridges separated by deep furrows that hold standing water. People with Viracocha showed them how to dig great ponds like structures called to this day "Cocha's" after Viracocha. The Indians listened and learned fast. Viracocha told them that everything they had learned was only a speck in the mind. The brain was capable of telepathy, collective unconscious and thought projection. He told then of a land now destroyed, the inhabitants used this type of "thought consciousness" as you would pick a fruit. It was a natural progression. Viracocha told the natives to collect certain roots and mushrooms and to return. He specified what type was needed and they must return at night when they saw the campfire. The natives looking with urgency and returned that very night. They handed the roots and herbs to Viracocha and he grounded and mashed the roots and herbs and made a reed tube. He passed it on and told the natives to concen-trate. Then all the natives went into a deep trance. First it produced vomiting and accelerated heart beats. The natives went mad singing and dancing then Viracocha told them to settle down and to concentrate hard. Their minds were flooded with sounds, dreams, visions, strange feelings, strange sensations, and colors, bright lights that can't be described. They were on a collective vision quest. Viracocha then told them to think of animals that they wanted to hunt and objects they wanted to locate. Viracocha told them he was the source. The companions with Viracocha played the flute, it filled them with awe and calmness. It seemed to add to the dream vision. The Indians were astounded, they were able to see great distances to lands they've never seen, future and past events. Viracocha could control the Vision State. He then showed them Atlantis, how it was and how the people were natural telepaths. He showed them the destruction by a giant tidal wave that left seven Builder Gods who escaped to Mesoamerica, Mediterranean, Egypt and Crete. The Amahuaca Indians, the Navajo's, the Pueblo Indians, the Hopi and Aymara peoples all believe in thought projection, vision-states and collective unconsciousness. When the Pueblo Indians want to build a house, they wait until the right thoughts are present. The Pueblo Indians believe that thoughts have a mind of their own. In Tibet there is a belief that "Thought Farms" can be brought into existence by long efforts of concentration. In Tibet they are called "Tulpas" and thought farms could be good or evil. The Shamans of India, the Witch Doctors of West Africa, the Aborigines of Australia all believe in Mind and Thought Projection and Dream States. In Brazil, in a small village called Kuma, was a Shaman called "The Porpoise Caller." He had the ability to call and control Porpoises. The Shaman slept and dreamt about Porpoises, he then let his spirit leave his body and visit the Porpoise people in the Porpoise Realm. He would hypnotise them and communicate with them. The next day at the beach, all the Porpoises would swim fast right up to him like they were hypnotised even sometimes allowing themselves to be breached and ridden. We now know that Porpoises, Dolphins and Killer Whales are extremely telepathic. After the natives became more and more aware and was able to control the vision quest, they realised there were subtle changes in their mental processes. They also noticed a mental acceleration, certain clairvoyance, faster reaction times and to anticipate events. 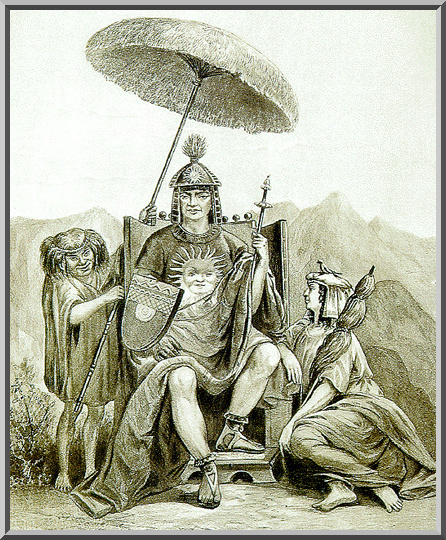 Viracocha told them he would establish a city of sun, shadow, moon and stars. This was called Teotihuacan... the name means "Place Where Men Became Gods"
Teotihuacan will take generations of time and effort but it will exist for years. Viracocha told them to build a pyramid mound. Viracocha told them of the mysteries of the pyramids, which radiates in all four directions. The symbolic pivotal place where a vertical channel led both to the heavens and to the underworlds. The four tiers of the pyramid represent the celestial levels. Teotihuacan was built on the Egyptian Cubit. It was a task that would take centuries. A num-erous place of 600 pyramids, over 500 workshops, a massive marketplace, 2,000 apartment compounds, canals and aquaducts. The city of Teoihuacan will be laid out on a grid anchored by north-south axis 8 miles long. The pyramid of the sun rose on the spot. It marked the passage of the sun from east to west to align with the Pleiades and to mark the equinoxes and the solstice. Viracocha told them to build on artificial mountains. The Great Pyramid of the Sun is about 20 ft. high, with five stages and an immense staircase. It lies over a natural cave in volcanic lava. Teotihacan engineers built reservoirs and canalised rivers and streams, erected administrative buildings and open-air monumants. Viracocha told them a special people would come and put their touch on the city. "It will be the largest city on the earth and have over 200,000 people". Then Viracocha told them he had to leave, he left and traveled north and departed from the east coast of Ecqador. Viracocha built a raft with his companions and reached Easter Island where he built statues resembling those he had built in Tiahuanaco. "We Have Been Waiting Five Hundred Years"
The Inca prophecies say that now, in this age, when the Eagle of the North and the Condor of the South fly together, mother earth will awaken. The Eagles of the North cannot be free without The Condors of the South. Ultimately you know, we are all native, because the word Native comes from Nature, and we are all parts of Mother Nature. She is inside us and, we are inside her. We depend totally on the Earth, the Sun, and the Water. We belong to the evolution of nature in our physical bodies. But we also have a spiritual body that comes from the Sun, not the Sun you can see with your two eyes, but another Sun that lies in another dimension, a golden Sun burning with the fire of spiritual source. We came to Earth from this Sun to have experiences on Earth, and eventually we will return to this Sun. We are Children of the Sun. their True White Brother, who left them in ancient times, promising to return. They wear their hair in bangs to form a window, they say, by which to see their Elder Brother when He Returns. It is also an identifying mark for the Elder Brother to recognize them. In 1975, the elders met in Canberra, drawing together over 350 Aborignal people. They gave a warning of cataclysms to come and told the people to go out and teach their knowledge to the world, to prepare it for a future time when we would go back to our beginnings; when all cuktures will exist as one. Quechua Messenger: Willaru Huarta grew up in the jungles of Peru, studying with the shamans. He says that his native Quechua Incan prophecies predicted the white man's coming would bring 500 years of materialism and imbalance. But now they say that the era is coming to an end and the Age of Aquarius will "Signal the Return of Light" to the planet and the dawn of a golden era. "We live in a time of the fulfillment of prophecy." "Humanity should cure itself and give help to the poor. Regenerate yourself with Light, and then help those who have poverty of the Soul. Return to the Inner Spirit, which we have abandoned while looking elsewhere for happiness." The Elders of this continent remember and talk about a prophecy that foretold how we will come together and reunite as one. We are like a body that was broken into pieces and this body will come back together to be whole again. They speak of this in the South, Center and North. Our Elders tell us that we will unite and get our strength back like many arrows that will not be broken. They remember the history to keep the fire alive. We have come together to be one, to have complete understanding. The main tool used was the arrow because our ancestors all over the continent were hunters. In time, they added this arrow to a sacred bow. This bow is used all over this continent and is what we call the half moon. They knew we would be around and this bow would be again in the center, marking the direction that we should take. If we take a step we send this arrow to follow. All our people have to make a new design for our children and the future generations. They said it is written in the stars and we have to make this work so they can move the spiritual energy. This will begin a new time when we can take the Spirit in our own hands when the Eagle and Condor reunite. Our leaders said that we should not forget to pass this message to our children. We will reunite our family and our people. Their Sun will be a new light. When this is done, the people will fulfill their destiny, all the pieces will be in place. In the unfolding of the life of the Indian Nations, every five centuries produces transformations of both foundations and forms. With these changes life does not lose its essence, it becomes covered with new skin. The old is rejuvenated and then nourished with pure energy. This energy is then transmitted by the great spirits of Allpa Mama and Pacha Mama, that is of nature and of the Universe in general. Thousands of years ago, when life initiated its vital cycle, Pachakamak (God of Time) created Intl (the Sun) and Quilla (the Moon) out of the union of its tears and thus, gave birth to the Runas, to the people of this continent Appla-Yala and in this birth emerged the Condor and the Eagle, the Kuntur of Urin and the Anga de Hanan, their spirits continually enriching the veins of the Runas of this continent. Their strength motivated the north and south to unite. The union of the people of the North with the South signifies the union of the Condor and the Eagle. 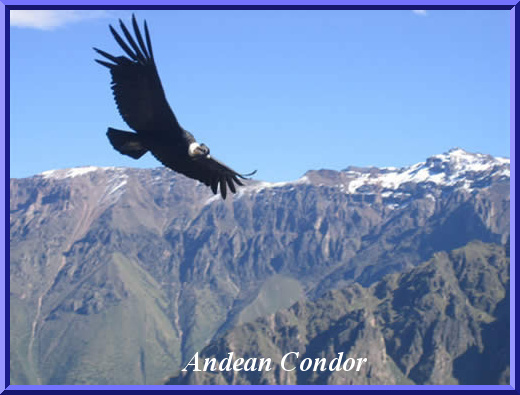 The Condor and the Eagle join their tears from Jahanpacha (the sky) to Ucupacha (the underground). Out of this union sprang Central America. In this piece of earth was concentrated the wisdom of Hana and Urin. New nation developed whose inhabitants had the capacity to sow the Earth in the middle of a great ocean and convert it into what is today Central America. 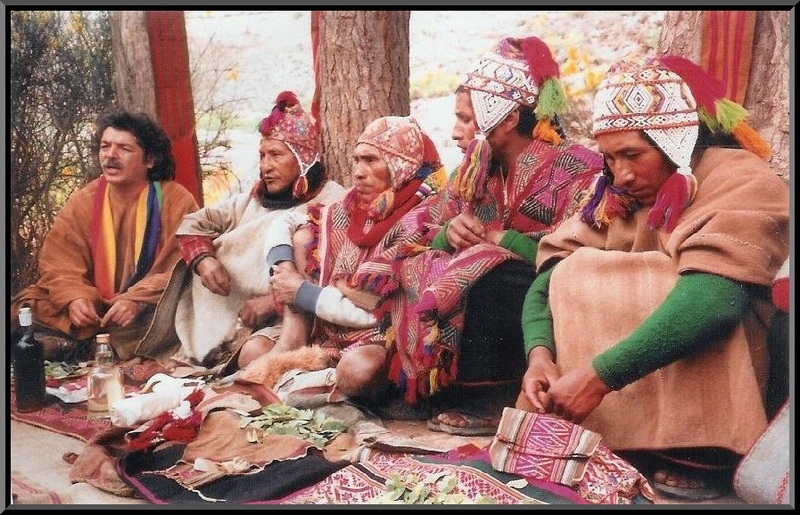 Dr. Alberto Villolodo, a psychologist and medicinal anthropologist, has lived among and trained with the Q'ero shamans and has played a key role in bringing their ritual and prophecy to the awaren-ess of the modern world. The Q'ero are the last of the Incas - a tribe of 600 who sought refuge at altitudes above 14,000 feet in order to escape the conquering conquistadors. For 500 years the Q'ero elders have preserved a sacred prophecy of a great change, in which the world would be turned right-side-up, harmony and order would be restored and chaos and disorder ended. The Q'ero had lived in their vill-ages high in the Andes in virtual solitude from the world until their "discovery' in 1949. In that year, Oscar Nunez del Prado, an anthro-pologist, was at a festival in Paucartambo, in southern Peru, when he met two Indians speaking fluent Quecha, the language of the Incas. The first Western expedition to the Q'ero villages then occured in 1955. 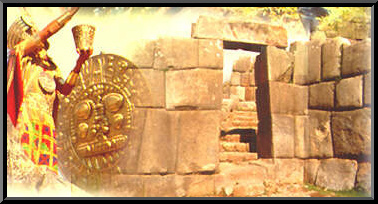 Four years later, at the annual Feast of The Return of the Pleiades taking place in the Andes, the gathering of 70,000 pilgrims from South America were awed, and the crowd parted to let the Q'ero, unannounced and wearing the Incan emblem of the Sun, make their way forward to the mountain top to make known that the time of the prophecies was at hand. They were welcomed by the assembly and were told, "We've been waiting for you for 500 years." The Shamanic Ritual had not been performed for 500 years. According to ancient prophecy, this is the time of the great gathering called the "Mastay" and reintegration of the peoples of the four directions. 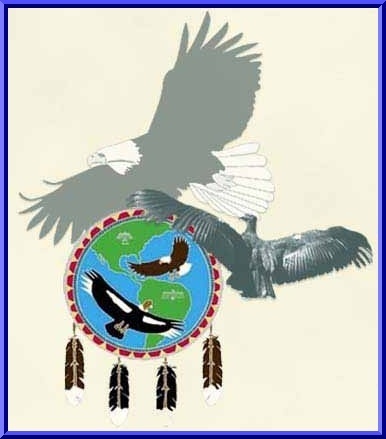 The Q'ero are releasing their teachings to the West, in preparation for the day the Eagle of the North and the Condor of the South (the Americas) fly together again. They believe that "munay", love and compass-ion will be the guiding force of this great gathering of the peoples. The new caretakers of the Earth will come from the West, and those that have made the greatest impact on Mother Earth now have the moral responsib-ility to remake their relationship with Her, after remaking themselves, said Don Antonio Morales, a master Q'ero shaman. When the Spanish conquered the Incas 500 years ago, the last pachacuti, or great change, occurred. The Q'ero have been waiting ever since for the next pachacuti when order would emerge out of chaos. For the past five centuries they preserved their sacred knowledge and finally, in recent years, the signs were fulfilled and the great time of change was at hand: the high mountain lagoons have dried, the condor is nearly extinct and the discovery of the Golden Temple has occurred, following the earthquake in 1949 which represented the wrath of the Sun. The prophecies are optimistic. They refer to the end of time as we know it... the death of a way of thinking and a way of being, the end of a way of relating to nature and to the earth. In the coming years, the Incas expect us to emerge into a golden age, a golden millennium of peace. 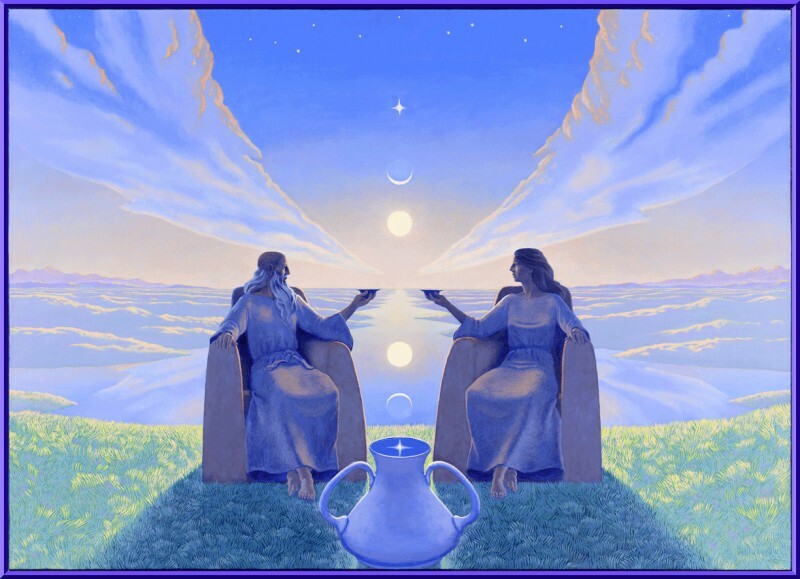 The prophecies also speak of tumultuous changes happening in the earth, and in our psyche, redefining our relationships and spirituality. The next pachacuti, or great change, has already begun, and it promises the emergence of a new human after this period of turmoil. The chaos and upheaval characteristic of this period will last another four years, according to the Q'ero. and was the architect of an empire the size of the United States. For the Incas, Pachacuti is a spiritual prototype... a Master, a luminous one who stepped outside of time. He is viewed as a symbol and promise of who we all might become. He embodies the essence of the prophecies of the Pachacuti, as Pacha means "earth" or "time" and the cuti means "to set things right." His name also means "Transformer of the Earth." The prophecies of the pachacuti are known throughout the Andes... there are those who believe the prophecies refer to the return of the leader Pachacuti to defeat those who took the Incas' land. But according to Dr. Villolodo, the return of Pachacuti is taking place on the collective level. "It's not the return of a single individual who embodies what we're becoming, but a process of emergence available to all peoples." The Q'ero have served as the caretakers of the rites and prophecies of their Inca ancestors. The Prophecies are of no use unless one has the keys, the rites of passage. The Star Rites are crucial to the practical growth described in the prophecies. (ritualistic offerings of mesa, or medicine bundles) at the ceremony in New York City, the shamans administered the Mosoq Karpay to the individuals present, transmitting the energies with the ancestors of their lineage. The transmission of the Mosoq Karpay is the ceremony representing the end of one's relationship to time. It is a process of the heart. This process of "Becoming" is considered more important than the prophecies themselves. The Karpay (rites) plant the seed of knowledge, the seed of Pachacuti, in the luminous body of the recipient. It's up to each person to water and tend the seed so that it can grow and blossom. The Rites are a transmission of potential; one must then make oneself available to destiny. The Karpays connect the person to an ancient lineage of knowledge and power that cannot be accessed by the individual. It can only be summoned by a tribe. Ultimately, this power can provide the impetus for one to leap into the body of an Inca, a Luminous One. That person is connected directly to the stars, the Incan Sun of Cosmology. The Q'ero believe that the doorways between the worlds are opening again. Holes in time that we can step through and beyond, where we can explore our human capabilites.. Regaining our luminous nature is a possibility today for all who dare to take the leap. The Andean shamans say, "Follow your own footsteps. Learn from the rivers, the trees and the rocks. Honor the Christ, the Buddha, your brothers and sisters. Honor the Earth Mother and the Great Spirit. Honor yourself and all of creation. Look with the eyes of your soul and engage the essential," is the teaching of the Q'ero.